Late night welcomed a new forum this week, when The Jim Jefferies Show debuted on Comedy Central. It’s too early to tell just how the Australian comic turned host will fit in with his satirical talk show neighbors. But so far, the former Legit star’s hallmarks appear to be slouching while sending up the latest disheartening news about humanity’s decline—be it government sponsored or otherwise—and lots of profanity. Jefferies took many swipes at Trump in his inaugural episode, including in his “This F**king Guy” segment, but to thoroughly lambast the president’s withdrawal from the Paris Accord, he enlisted the aid of a big name celebrity. 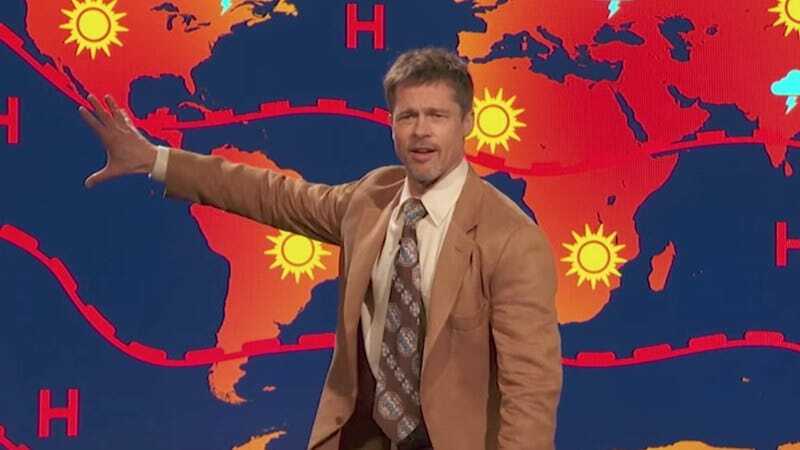 That’s Brad Pitt dourly playing weatherman, and his forecast calls for increasingly hellish conditions, as well as no chance of a future. Well, we could have told you that. The Jim Jefferies Show airs Tuesdays at 10:30 p.m. Eastern on Comedy Central.